It's almost time for Christmas again ! Play Buffet Wars during the event period to collect FREE Christmas goodies and exchange it for exciting Christmas items ! Collect Christmas goodies and recipes to create exclusive Christmas 2012 items. The ways to obtain is also the same as last year's event, for every PVE game win, you will get at least 1 Christmas goody. The more players in the game , the more goodies you will get! As usual, all unused goodies and recipes after end of event will be deleted, do collect and complete your recipes before the end of the event! All items crafted or purchased will not expire. Get the Christmas Exclusive Blue Elf Costume which is only be on sale during the event. After the event this costume will not be on sale anymore. Apart from costumes , Christmas Exclusive dishes will also be available. First new dish is the Sponge Cake. Sponge Cake can be cook using Flour and Egg and also, a recipe. The second Christmas exclusive dish is the Fruit Trifle! Fruit Trifle can be cook by collecting your ordinary Strawberry, the Christmas exclusive Sponge Cake, a Christmas exclusive ingredient, the Jello and of course with a recipe. 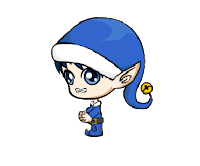 Collect all 3 Elf Costumes - Red Elf Costume , Green Elf Costume and Blue Elf Costume and you will be rewarded a Christmas 2012 exclusive badge. The badges are not awarded instantly upon meeting the requirements, we will add the badges manually at the end of the event. Get ready to collect your Christmas Goodies and ingredients!